Members of Parliament have authorised UK Prime Minister Theresa May to go back to Brussels and try to renegotiate her Brexit deal. But one of the Prime Minister's most important negotiating weapons has been taken off the table, as the House of Commons also voted to block a no-deal Brexit. The result of a series of votes on amendments to May's Brexit Plan B has left the Prime Minister with a large task ahead as the clock ticks towards the scheduled date of EU withdrawal on March 29. She had issued a plea for MPs to give her a clear mandate to reopen the Withdrawal Agreement which she agreed with the EU last November and seek to secure changes to its controversial backstop provision. May secured the backing of the Commons to go back to Brussels, as MPs voted by 317 to 301 in favour of a proposal from Tory grandee Graham Brady for her to try to replace the backstop with "alternative arrangements" to keep the Irish border open after Brexit. The cross-party plan, headed by Tory Caroline Spelman and Labour's Jack Dromey, won by 318 votes to 310, majority 8. It "rejects the UK leaving the EU without a Withdrawal Agreement and a Framework for the Future Relationship". The amendment's success came after MPs rejected a bid to delay Brexit in order to prevent a no-deal departure from the EU. 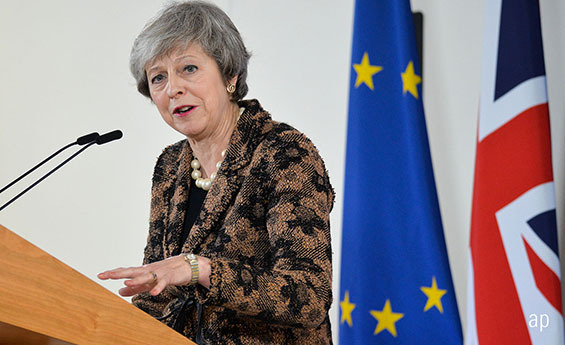 May made a plea to MPs to give her a "mandate" to reopen negotiations with Brussels by backing a proposal from Tory grandee Sir Graham Brady, which calls for the controversial backstop to be replaced by "alternative arrangements" to keep the Irish border open after Brexit. The chances of the Brady amendment succeeding were boosted when hardline Eurosceptics in the backbench European Research Group announced they would support it. But May's hopes of reopening the Withdrawal Agreement struck with the EU last November were dealt a blow by French President Emmanuel Macron, who described it as "not renegotiable". Speaking in Cyprus moments before MPs voted, Macron said: "As the European Council in December clearly indicated, the Withdrawal Agreement negotiated between the UK and EU is the best agreement possible. Macron called on May to present the EU's chief negotiator Michel Barnier with her next steps for avoiding a no-deal Brexit on March 29, which he said "no-one wants, but…we must all, despite everything, prepare for". Corbyn's amendment was defeated by 296 votes to 327, with MPs thought to have voted broadly along party lines. Another amendment, tabled by Tory Dominic Grieve, which sought to wrest control of Commons business from the government for six individual days in the run-up to March 29, was defeated by 321 votes to 301, majority 20. MPs then rejected Labour former minister Yvette Cooper's call for an extension of Article 50 to keep the UK in the EU until the end of the year in order to reach a deal. It was defeated by 321 votes to 298, majority 23, despite support by the Labour frontbench as well as Tories including Nick Boles. The amendment would have given Parliament control over the Brexit process if Theresa May fails to secure a deal by February 26. MPs would have been able to vote on delaying Brexit to the end of the year and preventing a no-deal exit under the terms of the Bill – although the Labour leadership said it would seek a shorter extension to Article 50. It was another win for the Government on the fifth amendment with MPs voting against Labour MP Rachel Reeves' plan by 322 to 290, majority 32.